Configuring ThreatSTOP reports to be delivered automatically by email. Save As: You can save a new report or overwrite a previously created report. Title: A brief title for the report. Email Address: The email address the report should be sent to. Email CCs: If the email should be sent to more than one address, enter the extras (up to three) here. Frequency: How often the emails should be sent out, this can be Daily, Weekly, or Monthly. 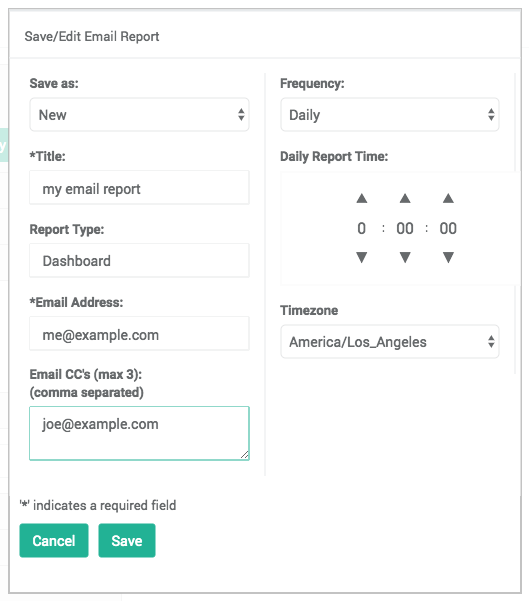 Daily Report Time: Determines the time of day that an email report will be generated. Once a given report is configured it can be saved by clicking the Save button at the bottom of the pop-up this will save the changes to your account and close the pop-up. Alternatively you can clear out new settings and close the pop-up by clicking Cancel. The email reporting screens for DNS Firewall and IP Firewall are identical and provide an at-a-glance view of the user’s created reports. No editing of the reports can happen from this screen, however reports may be deleted from the account by clicking on the delete icon. In cases where large numbers of reports are associated with an account the view can be adjusted to display more than the default 10 entries by adjusting the Show ## entries dropdown. If more reports are associated with the account than are visible with the current limit a paginator is available at the bottom right of the report clicking on the page number or Previous or Next will adjust reports being displayed. Title: Name given to the report when it was created. Recipient: Lists the primary email address associated with the report, which is the email address entered in the Email Address field during report creation. Frequency: Shows often the email is compiled and sent. Report: Denotes the Report Type. Available Report types are listed to the right. Actions: Actions available to take on the report. Currently this is limited to report deletion.